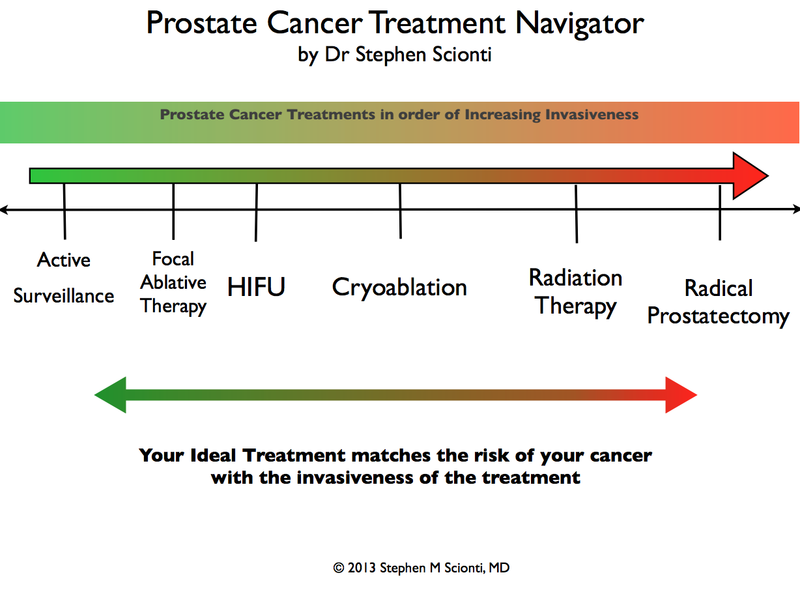 Dr. Scionti created his Prostate Cancer Navigator as a concise visual roadmap to help you understand your treatment choices. 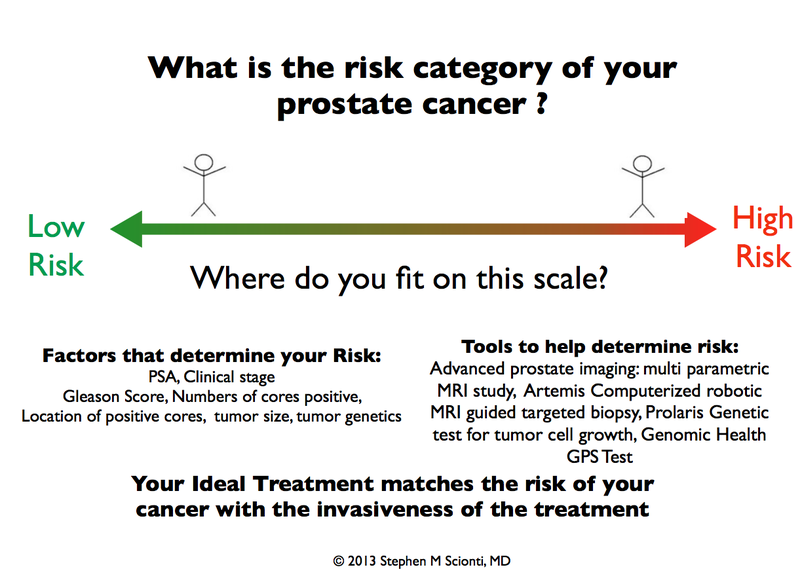 Thanks to Dr. Scionti’s Advanced Diagnostics, you will already know where your disease lies on the risk category scale. The Navigator then lays out prostate cancer treatments in the order of invasiveness. Finally, the Navigator shows the quality of life side effects risks, ranging from noninvasive to invasive treatments. Your ideal treatment matches the risk of your cancer with the invasiveness of the treatment. 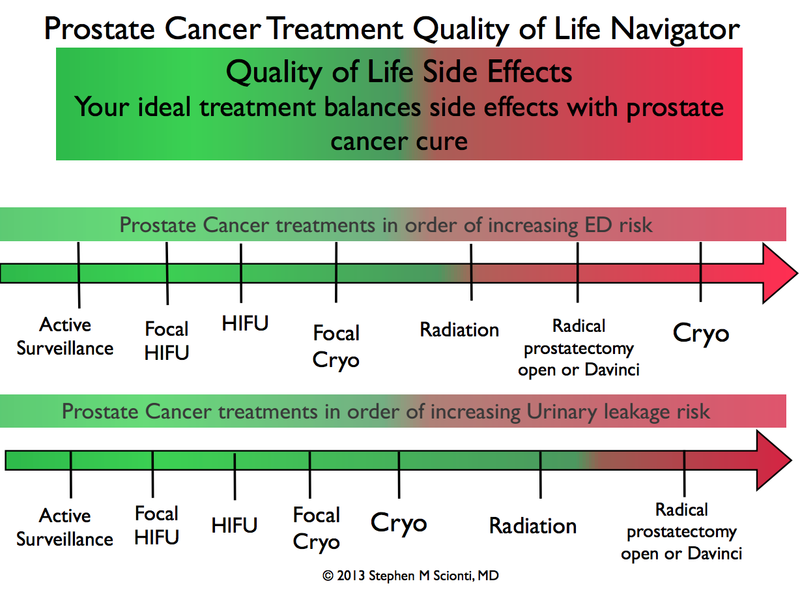 Your ideal treatment balances side effects with prostate cancer cure. Prostate cancer ideally should not be OVER TREATED, nor should aggressive high-risk prostate cancer be UNDER TREATED. The Scionti Prostate Center specializes in minimally invasive approaches such as High Intensity Focused Ultrasound (HIFU), Cryotherapy (freezing) and Targeted Focal therapy with HIFU, Cryotherapy, and MRI guided Focal Laser Ablation. Men who have small slowing growing tumors as revealed by Advanced Diagnostics may be excellent candidates for Active Surveillance and Dr. Scionti will monitor you through advanced imaging and advanced diagnostics until a future time when treatment may be needed. Our Advanced Diagnostic approach clearly identifies patients who really need treatment and allows Dr. Scionti to create a personalized and customized treatment and follow up plan. Since we do not use a cookie cutter approach, your visit to the Scionti Prostate Center provides you with Your Personalized Pathway to Prostate Cancer Care. We focus on effective treatments that preserve your quality of life.